In the many years that I have watched shows presented by the St Albans Operatic Society I have never found one which I would consider a “must see”. 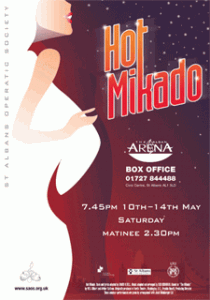 But the production of Hot Mikado at the Alban Arena this week is just that – a witty, slightly raunchy, really good fun show which ticks all the right boxes. Although I have seen Hot Mikado on two or three previous occasions I have never really noticed any significant difference from the Gilbert and Sullivan original. But director Ian Rowe’s take on the whole thing certainly is different and the fact that he has brought the action into the 20th Century has allowed him to give the classic a really fantastic make- over. Although the G and S influence is maintained throughout the show with some excellent performances of the finer songs such as Louisa Stevens’ exquisite rendition of The Sun and I, others including Three Little Maids From School have been given a sizzling facelift. Louisa is a tremendous Yum-Yum, the girl at the heart of the trouble, while Pedro Lloyd Gardiner as the deeply in love Nanki-Poo really gets the show rocking. Adding the right amount of comedy is Graham Jackson as the unwilling Lord High Executioner, Ko-Ko, and Matthew Gregory as Pooh-Bah. Robert Milner produced a very with- it Mikado and Katisha, who might be labelled the villain of the piece, was revealed in an amazing, almost show- stopping, new light by Charlotte Gregory. But in spite of the inspired performances, the show would have been nothing without the outstanding choreography by Chris Cuming and really hot music directed by Graham Thomson. The result is a really outstanding, swinging, modern, semi-rock musical which takes St Albans Operatic Society to new heights. The show runs until Saturday (May 14) and tickets can be obtained from the Arena box office on 01727 844488 or email booking@saos.org.uk. Performances are at 7.45pm with a Saturday matinee at 2.30pm as well.